My cousins all left, but I have stayed in Radauti for a couple more days, continuing my photo documentation for my (Candle)sticks on Stone project — and also carrying out some more family history research — and making discoveries, some of them even rather surprising: the grave of my great-great grandmother; the house where she lived; questions about my grandmother’s birth date and circumstances; even the date of my great-grandfather Anschel’s death. I’m not obsessive about genealogy by any means, and in fact — despite the fact that I have visited my great-grandmother Ettel’s grave on several occasions over the year (click HERE to see the progression) — I have never really looked into our family history in a serious way. But our session at the town hall with Dorin Frankel last week, and our subsequent trip to Vicovu de Sus and discovery of what we believe was the house where our great-grandfather Anschel lived in 1880, left some loose ends that needed tidying, or at least some questions that I wanted to try to answer. I couldn’t leave town without at least trying to resolve them. One of these was a street address in Radauti — strada Larionescu 20 — that my second cousin, Rae Barent, who has made a serious effort a tracing family history, sent — and which was confirmed by the records I looked at during a second session with Dorin at City Hall yesterday. This was the address where my great-great grandmother, Chaya Dvoira Herer Halpern, lived. This morning, armed with the plot and row numbers I found on the Radauti cemetery web site for a “Chaya Dvoira daughter of Moshe Morko” who died in 1905, I returned to the Jewish cemetery. Mr. Popescu showed me the row — and I entered the tilting forest of stones, again crunching through the undergrowth in my boots. 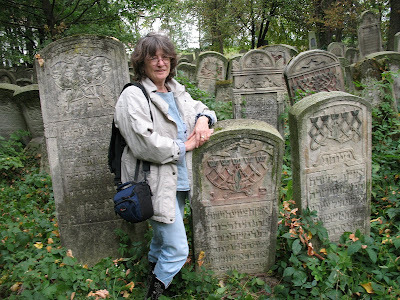 I had to scrutinize the Hebrew epitaphs on each one, testing my basic Hebrew to its limits. After half an hour or so, there it was: I could read the name. The stone is smaller than some of the others, but it has the typical braided candlesticks and hands raised blessing the flames, beautifully carved. And there are still traces of red and green paint. I pulled away a strand of stray vines: not sure what, if anything, I actually felt. Glad to be there; cognizant of distance, time, realms; the passing of time and history. Wishing the others could have been there too. Wondering what she looked like! My cousins and I had tried to find Larionescu street, but in today’s city there is no record of it. Dorin Frankel, however, knew where it was — near the synagogue — and he walked with me there after our session yesterday morning at City Hall. The street name has been changed, but the house is still there — nicely maintained and modernized inside. Looking into courtyard of house at Larionescu 20. At Chaya Dvoira’s pump. Strada Larionescu 20. — my great-grandfather Anschel Gruber (the one who lived in the house we found in Vicovu de Sus) died in 1914, possibly in September of that year. But his death wasn’t recorded in the registry until 1920. The book says he is buried in the Radauti cemetery. — There is no birth record for my grandmother, Rebecca Rosenberg, who I thought was born in about 1895…. BUT there is a record of the birth to Rebecca’s parents, Zirl (later Anglicized to Celia) Halpern and David Rosenberg (not officially registered as married at the time), in Oberwikow, or Vicovu de Sus of TWINS on Sept. 25, 1899 — including a daughter Rifka (Rebecca in Yiddish) and a son, Jüdel, whose bris was on Oct. 2. The family left for the States in about 1906, but Jüdel’s death is included in the Radauti City Hall registry (though added in 1920), indicating he must have died very young.